…Putin needed a story to spin, no matter how full of holes, and thus the neo-Nazi claims. But as it turns out, Crimea’s streets are not exactly paved with extremists—a fact that has proven troublesome for Russian state TV channels looking to find token far-right bogeymen. And of course, Crimea’s streets are not full of Neo-Nazis, because the population of eastern Ukraine wholly rejects the abhorrent ideology of the “Euromaidan’s” Nazi vanguard, and backs Russian forces who have been permanently stationed there for years under treaty and as a consequence, have deterred any abusive incursions by the far-right into the region. Still, the impression the Daily Beast would like to get across to readers is that the concept of Neo-Nazis leading the so-called “revolution” in Kiev, is absurd. In fact, the truth that Kiev’s Independence Square was full of Nazis, was right under the nose of the entire world – with a handful of Western journalists even admitting as much. The impressive pictures broadcast by the Western media of mobs filling Independence Square featured scores of large flags waving in the crisp cold air of Kiev. 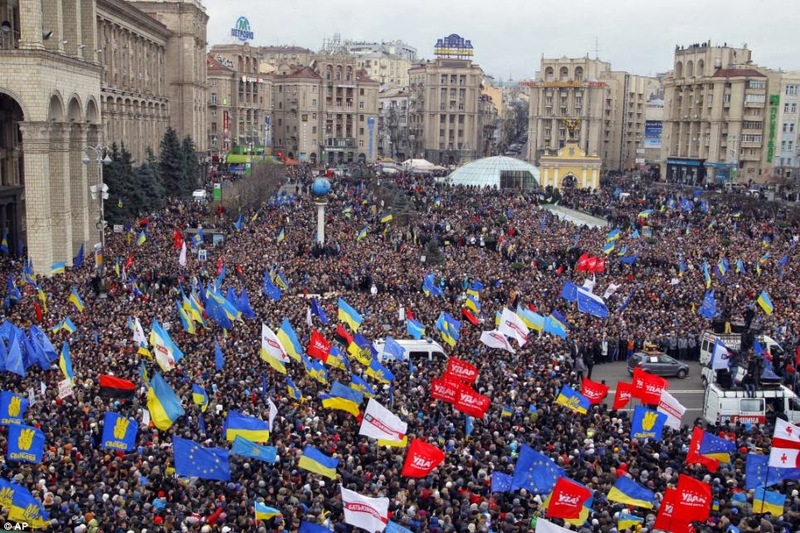 Prominent among them were the blue and yellow banners of Svoboda, with a peculiar 3-fingered salute stamped on each one. The odd iconography, had the Western media investigated, is in fact a revised Nazi salute, a play on the Ukrainian coat of arms and German Neo-Nazi Michael Kühnen’s three-fingered salute. Before that, Svoboda used the more obvious “Wolfsangel,” popular among Neo-Nazis and a symbol used by the Waffen SS during World War II. Image: Neo-Nazi flags unfurled side-by-side with the European Union’s – with the revised 3-fingered salute on Svoboda’s party flag, the familiar Nazi black and red of “Right Sector,” and flags of the Hitleresque “Fatherland Party,” all hidden in plain sight in front of the world. The Western media’s selective omissions and its intentional failure to investigate and expose the true nature of an opposition they portrayed as “pro-democracy” and “pro-West” helped build international support for a movement the global public would otherwise have recoiled in disgust from. Svoboda was officially linked to paramilitary organizations until as late as 2007, and is still loosely affiliated with them. The organization has attempted to “soften” its image, or in other words, bury its extremist ideology under a moderate facade to covertly move it forward. “The Svoboda party also has excellent ties to Europe, but they are different from the ones that Klischko might prefer. It is allied with France’s right-wing Front National and with the Italian neo-fascist group Fiamma Tricolore. But when it comes to the oppression of homosexuality, representative Myroshnychenko is very close to Russian President Vladimir Putin, even if he does all he can to counter Moscow’s influence in his country. the West has openly and eagerly supported. 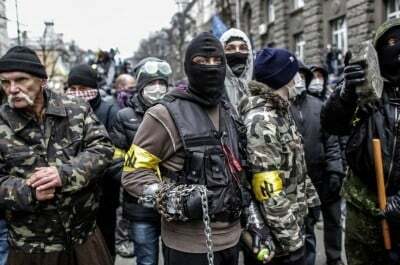 Speigel Online notes what other independent geopolitical analysts have been saying since the mobs took to Kiev’s streets months ago, that the “pro-democracy,” “pro-European” facade was propped up by literal Nazis who were armed and fully backed by the US – and without which, the entire movement would have collapsed. But while the party’s radical past can be papered over, it cannot be erased. Its name until 2004 was the “Social-National Party” and it maintains informal links to another group, the Patriots of Ukraine, regarded by some as proto-fascist. 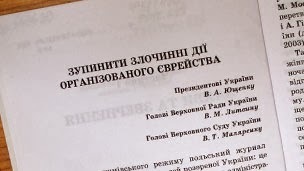 In 2004, Tyahnybok was kicked out of former President Viktor Yushchenko’s parliamentary faction for a speech calling for Ukrainians to fight against a “Muscovite-Jewish mafia” – using two highly insulting words to describe Russians and Jews – and emphasising that Ukrainians had in the past fought this threat with arms. In 2005, he signed an open letter to Ukrainian leaders, including President Yushchenko, calling for the government to halt the “criminal activities” of “organised Jewry”, which, the letter said, was spreading its influence in the country through conspiratorial organisations as the Anti-Defamation League – and which ultimately wanted to commit “genocide” against the Ukrainian people. 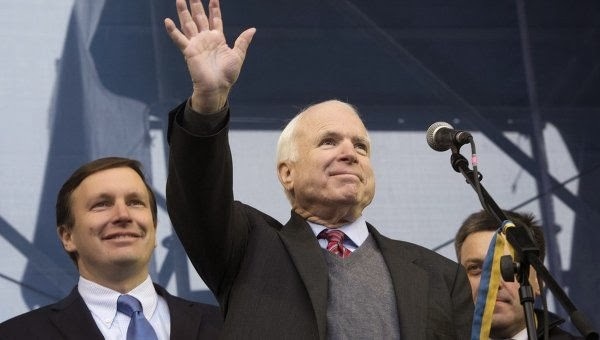 Astonishingly, it would be overt Jew-hater Oleh Tyahnybok that US Senator John McCain would share the stage with in Kiev during the climax of “Euromaidan” in support of the “pro-European” mobs. Image: US Senator John McCain in Kiev flanked on his left side by overt Jew-hater and Svoboda party leader, Oleh Tyahnybok. The West’s willingness to ally itself with violent bigots, racists and literal Nazis exposes its “values” as nothing more than a selectively upheld facade easily disposed of when inconvenient – and entirely designed to couch its true, corporate-financier driven hegemonic designs behind. While the opposition that has now seized Kiev claims to share “European values,” one must wonder just what those values are. While the West uses alleged anti-homosexual policies in Moscow as a pressure point against Russia, it gladly allies itself with anti-homosexual bigots and racists in Kiev. Apparently, “European values” are whatever can be selectively leveraged when beneficial, and blatantly ignored when inconvenient. While other groups among the Ukrainian opposition exhibit their extremist views more overtly than Svoboda, like Right Sector, there are also opposition parties that conceal their bigotry, racism, and right-wing ideology with more skill. This includes protest leaders in Kiev such as Arseniy Yatsenyuk and Oleksandr Turchynov, both of deposed, disgraced, convicted criminal, former Ukrainian Prime Minister Yulia Tymoshenko’s All Ukrainian Union or “Fatherland” party. Both have taken controversial stances regarding homosexuals. The BBC itself has already admitted that armed Nazis played a leading role in overthrowing the elected government of Viktor Yanukovych. In its short video report, “Neo-Nazi threat in new Ukraine,” it exposes a nightmarish resurgence of Nazi ideology, and all the blind hatred and violence that goes with it. Despite this admission, the British state-owned media arm would publish an outrageous article titled, “Crimea seen as ‘Hitler-style’ land grab,” where BBC editor Simona Kralova attempts to draw historical parallels, not between Russia’s stalwart fight against Nazis in World War II, but how Russia is now acting like the Nazis in World War II. After admitting that the West backed literal Nazis in the armed overthrow of a democratically elected government in Kiev, for the BBC to then accuse Russia and in particular President Vladimir Putin’s defense of what’s left of Ukraine as a “Hitler-style land grab,” presents unparalleled deceit, and perhaps even desperation from the Western media. One must wonder what else the West would expect Russia to do directly along its own borders, when it itself admits Nazis have overrun the Ukrainian capital (with their assistance) and considering the disastrous toll Russia paid during World War II when last they crossed paths with Adolf Hitler’s toxic Nazi ideology. 20 to 30 million Russians died in that struggle, perplexing the mind that the West would now condemn Russia for minding the lessons of history and standing up against Nazism yet again before it is able to find a foothold from which to exact another historically tragic toll upon humanity. The BBC and others across the Western media have for years quietly chronicled the rise of extremist groups like Svoboda in Ukraine, and despite this, they have turned apologists for ideologies and agendas they themselves categorize as intolerable within their own societies. Much of what Svoboda and other right-wing groups now in power in Kiev do, would be considered “hate crimes” in the West where Svoboda draws its support. Russia finds itself once again on the right side of history, but again, appears poised to pay the price. While growing numbers of people begin to see through the “Euromaidan” facade, the US, UK, and EU are already poised to for a wider confrontation with Russia over its attempts to check the fascist foothold the West has created directly along its borders. It is truly dangerous times when Nazis are the heroes and those standing up against them are the villains. The tired but true cliche of “failing to learn from history,” comes to mind. The doom of repeating history now lays before us.